The US Patent and Trademark Office revealed today that Apple filed for their new iOS “Passbook” application icon under application number 85762373 last Wednesday, October 24, 2012. Apple’s trademark application states that the following is associated with the new icon: The color(s) black, green, yellow, and blue is/are claimed as a feature of the mark. The mark consists of an outside square that is black; a green card on the left with an image of a teacup on it; a yellow card with an image of an airplane on it; and a blue card with an image of a video camera on it. The filing was under International Class 009 which covers: software related to handheld digital devices; electronic and encoded gift cards; computer software; computer software for personal information management, and data synchronization software. Apple’s filing claims priority based on their earlier trademark of Passbook in Canada back in June (which hinted at the possibility of a future ‘iWallet’ application). The company also filed a Passbook icon trademark this morning in Hong Kong as well. 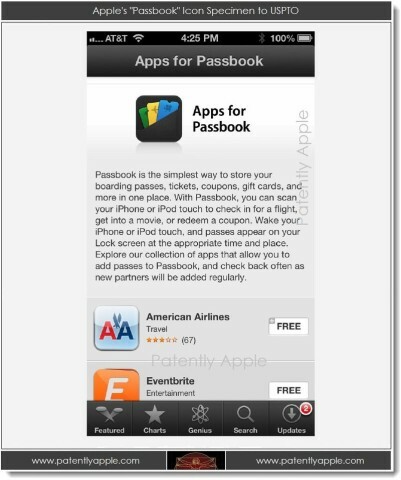 Numerous apps continue to be updated with Passbook integration. Air Canada updated their app to bring boarding passes to Passbook and Cineplex Mobile was updated for movie ticket notifications.